This hard cheese is one of the great cheeses of the world. It is usually made with cow’s milk, but I frequently made it from goat’s milk. Goat and ewe’s milk both produce a slightly softer curd than cow’s milk, and they require slightly reduced temperatures. The curds from these milks also need slightly less pressing. Sterilise all the equipment in hot water and ensure that the room is not subject to cold draughts. Give yourself plenty of time, without the possibility of interruptions. This makes approximately 0.5kg (1lb) of Cheddar Cheese. The final weight will vary depending on the type of milk. For a larger quantity, adjust the ingredients accordingly. It should be pointed out that it is far more economical to make a larger quantity than the one stated here because it takes just as long to make a small cheese as a larger one. Pasteurisation: Pasteurise the milk to destroy unwanted bacteria. To avoid damaging the subsequent curd, this is normally 66 OC held for 30 minutes. Cool to 21 OC. Starter:Stir in the starter and leave the milk, covered in a warm place for about an hour so that it can acidify. Don’t leave it for much longer than this otherwise the cheese may be too dry and crumbly. Rennet: Increase the temperature to 28 OC for goat or ewe’s milk, or to 30 OC for cow’s milk. Mix the rennet with two teaspoonfuls of previously boiled and cooled water and then stir it in. Give it another stir 5 minutes later to stop the cream collecting at the top. Cover the container and then leave the milk to set in a warm place. Setting: (Coagulating): The curd is normally ready when it is firm to the touch, gives slightly and does not leave a milk stain on the back of the finger. Note that with vegetarian rennet, setting takes longer than with animal rennet. It also takes longer in a cooler environment. Cutting the curd: This is where the curd is cut in order to release the liquid whey. Cut down into the curd, from top to bottom one way then cut it at right angles to form square columns. The curd is then loosened from around the walls of the pan. Unless a curd knife is available to make horizontal cuts, a palette knife can used to make diagonal cuts to break up the curd into pieces that are approximately pea-sized. Stir gently with the hand for a couple of minutes. Scalding: Sometimes referred to as cooking, this is where the temperature of the curds and whey is raised slowly while occasional stirring of the curds takes place by hand. Gradually increase the temperature to 38 OC over the next 30-40 minutes. Pitching: This is the process of giving the whey a final, circular stir so that it whirls round. The curds then gradually sink to the bottom and collect at a central point. Turn off the heat and leave the pan until all movement has ceased in the liquid. Running the whey: Ladle out as much of the liquid whey as possible, then place a previously sterilised cloth over a stainless steel bucket or large basin and tip in the curds. Make the cloth into a bundle by winding one corner around the other three. This is called a Stilton knot. Place the bundle on a tray which is tilted at an angle to let the whey drain away. Leave for about 15 minutes. Stacking or cheddaring (Texturing):Untie the bundle and the curds will be seen to have formed into a mass. Cut this into four slices and place one on top of the other then cover with the cloth. After about fifteen minutes place the outer slices of the curd on the inside of the stack, and vice versa. Repeat this process several times until the curd resembles the texture of cooked breast of chicken when it is broken open. Milling: This is the process of cutting the curd into pea-sized pieces. Traditionally a curd mill was used for this, but it is easy to do it by hand. Salting: Sprinkle 10g salt onto the milled curds. rolling them gently without breaking them further. Moulding: This is the process of lining the cheese mould from the press with previously boiled cheesecloth and adding the curd until the mould is full. The corner of the cloth is then folded over the top of the cheese and it is ready for pressing. Pressing: Once in the mould the curds have a wooden ‘follower’ placed on top so that when the mould is put into the press there is a surface on which to exert an even pressure. Pressing cheese is essentially a process of compacting the curds while extracting the liquid whey. For the first hour, apply a light pressure so that the fats are not lost with the whey then increase it to the maximum and leave until the following day. Next day, remove the cheese from the press, replace the cloth with a clean one and put the cheese back in the mould, upside down, and press for another 24 hours. Drying: Remove the cheese from the press and cloth and dip it in hot water (66 OC) for one minute in order to consolidate and smooth the surface. Place it in a protected area at a temperature of 18-21 OC and leave it to dry for a day or two until a rind begins to form. Sealing: Once the rind has formed the cheese can be sealed to prevent it becoming unduly desiccated while it is maturing. 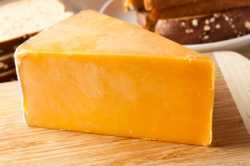 Large cheeses are sometimes bandaged but it is much easier to use cheese wax that is available from specialist suppliers. Using a water bath, heat the wax in a pan and stir it to ensure that it is melting evenly. Do not leave the pan unattended in case of fire! Dip the cheese into the liquid wax and coat thoroughly. It sets quickly, so rotate the cheese so that the area where your fingers are touching can also be coated. If preferred, you can paint on the wax with a paintbrush but this will probably need two coats. Maturing: The last stage is often the all-important one. A cheese, which is tasteless and bland when freshly made, is full of flavour and body after its proper ripening period. Leave to mature in a cool, dry place at 8 – 11 OC where it should be turned daily for the first three weeks, then on alternate days after that. For a large mild cheese, ripening should take place for at least three months. A longer period of ripening produces a more mature cheese. Smaller cheeses are usually ready after a month.